SPRINGFIELD - After 732 days without a state budget, the Illinois House of Representatives took a significant step toward ending the longest impasse of any state in the country by approving a revenue bill Sunday. Amendment 3 to Senate Bill 9, which includes a state income tax hike, passed by a 72-45 vote that included 15 Republican votes. The vote total was one more than the super-majority necessary. The House then immediately moved to Senate Bill 6, a balanced budget bill, which passed by an 81-34 vote. That bill included $350 million additional education funding for the evidence-based school funding model as well as increased funding for regular transportation for schools. "It is very difficult for anyone of either party to vote for a tax increase, but it had become clear that the state did not have enough revenue to even cover the schools budget it passed last year, let alone higher education, social services and the many other state services that people all over the state depend on. 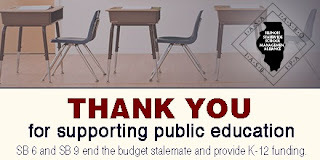 We want to thank those legislators that took this tough vote," said Roger Eddy, executive director of the Illinois Association of School Boards (IASB). The income tax increase from 3.75 percent to 4.95 percent returns that tax almost to the temporary 5 percent income tax that was rolled back two years ago. At the time the income tax increase expired on January 1, 2015, the state's backlog of bills was $4.36 million. Today, according to the State Comptroller's website, that backlog stands at more than $14.7 billion. The lack of revenue resulted in the state making only two of four payments to schools for items such as transportation and special education, resulting in the state owing schools more than $1 billion for last year alone. "School administrators all over the state have been making tough decisions and cuts because of the lack of state revenue. Providing educational opportunities for our students is the best investment the state can make in its future and we thank those legislators who stepped up for our schools," said Dr. Brent Clark, executive director of the Illinois Association of School Administrators (IASA). "We are grateful to legislators from both parties that stepped up and voted vote to save our schools and our state," said Dr. Michael Jacoby, executive director of the Illinois Association of School Business Officials (IASBO). "We appreciate those state representatives that had the political courage to be a champion for our school children. Thanks to them, our schools will be able to open on time this fall," said Jason Leahy, executive director of the Illinois Principals Association (IPA). The amended revenue and budget bills now move to the Senate, which is expected to consider the measures when it reconvenes Monday. Other proposals, including a property tax freeze, pension reform and worker's compensation reform, also are expected to be called for a vote in the House and Senate in the next few days. The Illinois Statewide School Management Alliance includes the IASB, IASA, IASBO and IPA.